I can't remember anymore if I mentioned that I have a slight obsession to modify my Toyota Corolla. Blame it on playing the video game Need For Speed & Fast & Furious plus more recently, watching Transformers The Movie. After checking out some auto accessories stores and canvassing at some car shops, I've come to the conclusion that I don't have the budget for any major modification. So any 17" mags, adding bumpers, spoilers, sidesteps and the like will for now remain a dream. What I was able to do with my limited budget was customize my car by adding some reflectors, stickers and minor car accessories. Out of frustration, I decided to turn my customization obsession to my laptop. 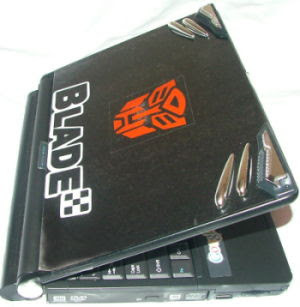 Thinking of how my laptop would stand out, I wanted to place some neon lights on the cover, but haven't been able to go to Gilmore where the computer haven awaits me. 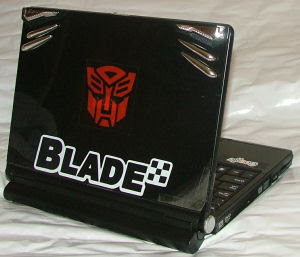 So with the extra car accessories I bought which I didn't use for my car, I thought of adding them on to my laptop. What is supposed to be applied to the car doors to prevent it from being dented, is the exact same thing I placed on top of my laptop. I also added some other visuals to make it more appealing and hip. I'm pretty happy with the outcome cause it doesn't look like a standard laptop anymore. I still plan on placing two blue or red neon lights wihch would intersect at the top center highlighting the autobot insignia. Great too while the Transformers hype is still at an all-time high. I wonder what else I can do to my laptop ?